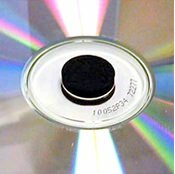 Attach your discs to a product catalog, brochure, textbook, or other surface with these adhesive disc hubs. Soft foam ring holds a disc securely in place and fits everything from full size to minis and business cards. Adhesive backing sticks to most surfaces.